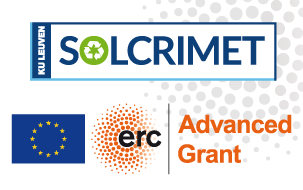 SOLCRIMET, representing “Solvometallurgy for critical metals”, is the ERC Advanced Grant Project of Prof. Koen Binnemans and his team at KU Leuven. 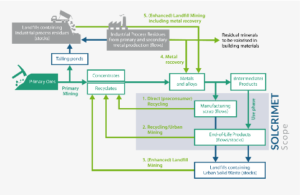 SOLCRIMET targets solvometallurgical solutions for the selective recovery of critical metals from urban End-of-life waste streams. For most of its hi-tech applications (smart phones, electronics…) and cleantech applications (wind turbines, electric cars…) Europe is heavily dependent on countries like China who dominate the productions of the metals that are needed for these applications. In case a metal is economically very important and it suffers from a high supply risk (meaning that the easy supply of this metal can be blocked), such a metal is called a “critical metal”. To become less dependent on countries like China for these critical metals, Europe needs to develop novel technologies that are able to remove and recover the critical metals that are present in End-of-Life products that are available in Europe, such as End-of-Life electric cars, smart phones or wind turbines. 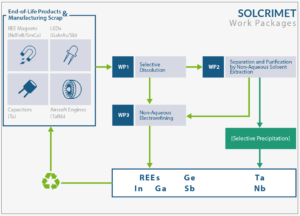 SOLCRIMET develops new technology, based on environmentally-friendly, non-water nor acid-containing solvents that selectively recovers critical metals from a diversity of End-of-Life products. SOLCRIMET will make sure that the development and production of hi-tech and clean-tech products in Europe will become less dependent on the import of expensive, critical metals from countries like China. SOLCRIMET will contribute to the required transition from the present, fossil fuel based linear economy towards a climate-friendly, circular economy in Europe. The research leading to SOLCRIMET results received funding from the European Research Council (ERC) under the European Union’s Horizon 2020 Research and Innovation Programme: Grant Agreement 694078 — Solvometallurgy for critical metals (SOLCRIMET).